Isobel is a prodigy portrait artist with a dangerous set of clients: the sinister fair folk, immortal creatures who cannot bake bread, weave cloth, or put a pen to paper without crumbling to dust. They crave human Craft with a terrible thirst, and Isobel’s paintings are highly prized among them. But when she receives her first royal patron—Rook, the autumn prince—she makes a terrible mistake. She paints mortal sorrow in his eyes – a weakness that could cost him his life. Furious and devastated, Rook spirits her away to the autumnlands to stand trial for her crime. Waylaid by the Wild Hunt’s ghostly hounds, the tainted influence of the Alder King, and hideous monsters risen from barrow mounds, Isobel and Rook depend on one another for survival. Their alliance blossoms into trust, then love, violating the fair folks’ ruthless Good Law. There's only one way to save both their lives, Isobel must drink from the Green Well, whose water will transform her into a fair one—at the cost of her Craft, for immortality is as stagnant as it is timeless. Isobel has a choice: she can sacrifice her art for a future, or arm herself with paint and canvas against the ancient power of the fairy courts. Because secretly, her Craft represents a threat the fair folk have never faced in all the millennia of their unchanging lives: for the first time, her portraits have the power to make them feel. 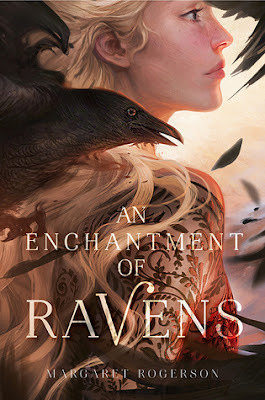 I loved An Enchantment of Ravens. It’s been a long time that I’ve been waiting for a Fey series that sucked me in the way Julie Kagawa’s Iron Fey did and this was definitely that novel. It is one of those times where I’m both sad and grateful for it to be a standalone. Although I could go for some novellas on the courts. I loved Isobel as the main character. She is such a clever girl that lives her life with both eyes open. Wide. Especially in a world where one could easily be sucked into the magic of the Fair Ones and what they offer. She is a painter and a master of her craft. I love the way she takes such pride in her work and how much of it is a part of her that she is not willing to give up. Rook and Gadfly. I loved both of these Fair Folk for different reasons. I loved the way Rook is strong, yet curious. He comes across almost a little more human than most of the other Fair folk and I feel like this is important in the role he plays. I loved him but I can’t necessarily explain why. Plus I just love his interactions with Isobel and maybe that is really what gives him that slight more human quality. At the same time, as much as Gadfly is a Fair One there is also something very different and special about him. He reminds me of the Caterpillar in Alice in Wonderland, always has something up his sleeve. Fair Ones, Fey, fairies are portrayed in all different ways in different stories. I really like the way they are done in this story. As much as they may play tricks on humans, they are also fascinated with them. It shows a different side of living forever. They see the humans possess things that they are unable to and leads them to a childlike curiosity. So much so that they tried to emulate them in their banquets and balls even though they are not quite sure what they are doing. There is also something very wrong in the land of the Fey and I like the way it’s shown. I love the romance and that it builds gradually and doesn’t feel like it just floods in. It ensnared my heart. They have a way of playing off each other that fits perfectly. I enjoyed the story and Margaret Rogerson writing so much. If you have any inclination towards Fey stories, I would say definitely pick this one up.